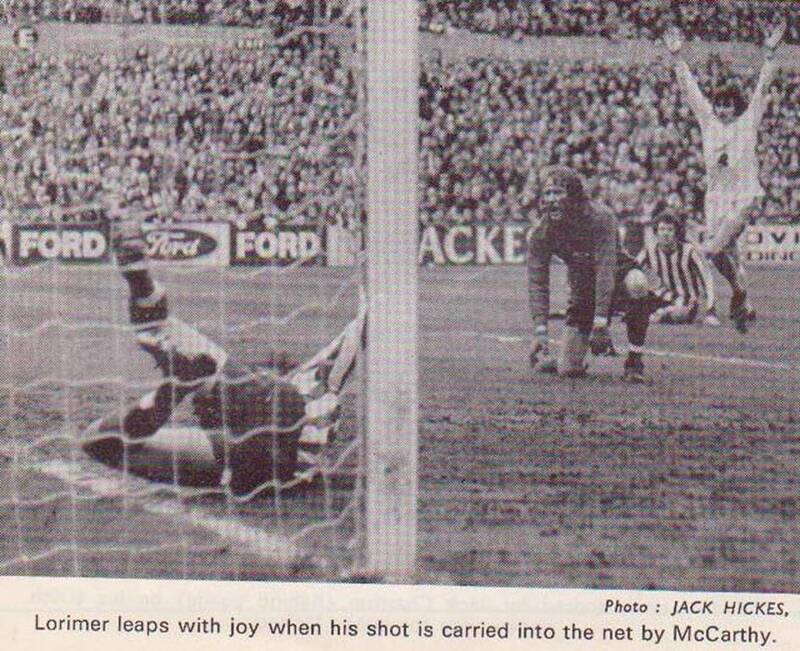 Date: Saturday, 4th March 1972. 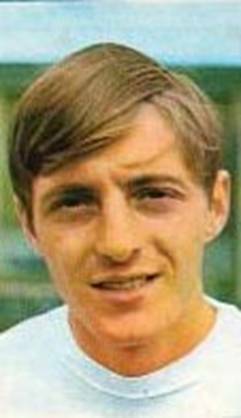 Scorers: Leeds United: Clarke (2), Lorimer (3), Charlton, Jones. Southampton: Nil. 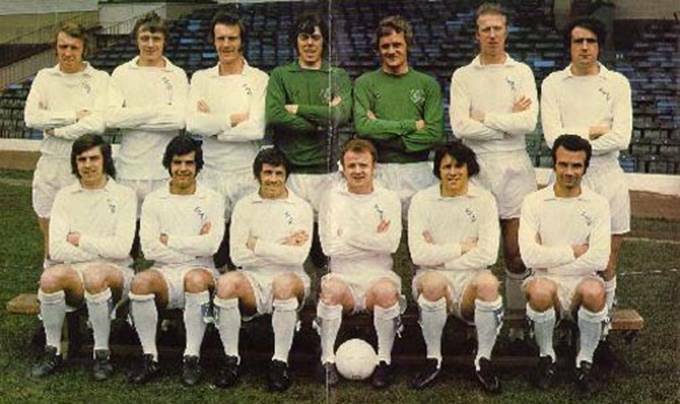 Leeds United: Sprake; Reaney, Madeley; Bremner, Charlton, Hunter; Lorimer, Clarke, Jones, Giles, E. Gray. 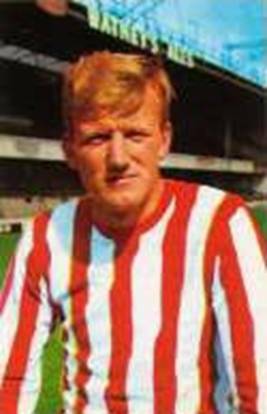 Southampton: Martin; McCarthy, Fry; Stokes, Gabriel, Steele; Paine (Byrne), Channon, Davies, O’Neill, Jenkins. 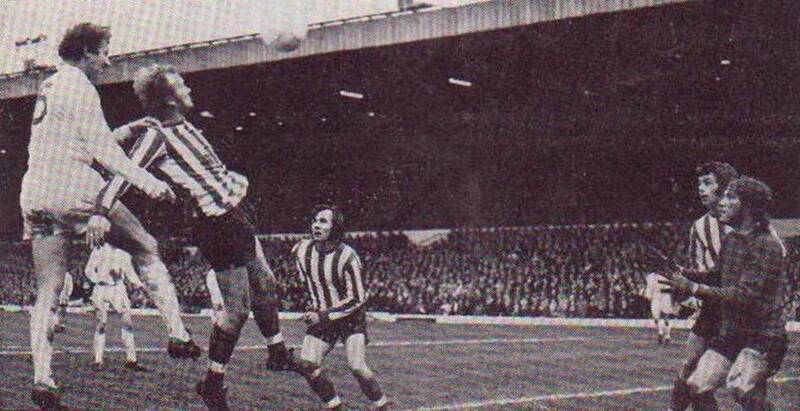 United’s critics had often branded them dour, defensive and downright dull in their quest for success, but in 1971-72 Leeds set the First Division alight with dazzling, fluent football that won them thousands of new friends. United went into the fixture with hopes of a League and FA Cup double still very much alive and in the middle of a purple patch. 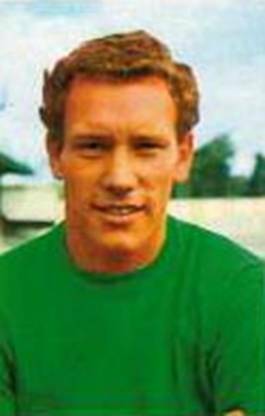 Emphasis was placed on attack and Leeds produced the sort of football that had the back pages of the national newspapers dubbing them “Super Leeds” and drawing comparisons with the legendary Real Madrid. Such acclaim gained credence in the eyes of millions of television viewers who tuned in to see BBC’s ‘Match of the Day’ cameras capture the action at Elland Road. 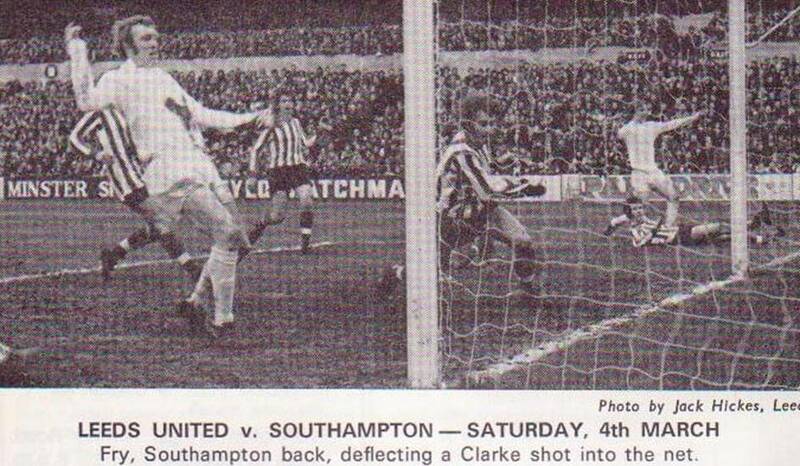 One of the televised games was against Southampton in the midst of United’s purple patch when they delighted the viewing public with a scintillating performance. 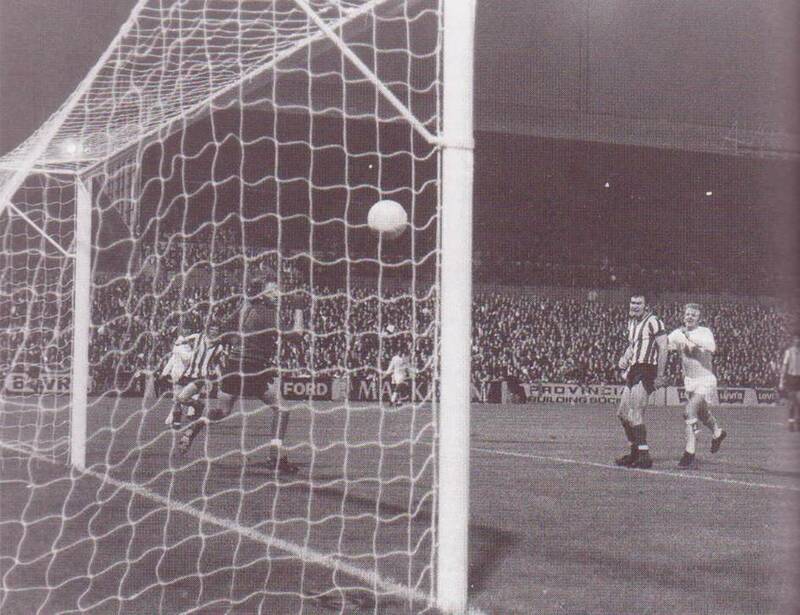 None of the goals were particularly spectacular, but each one followed great sweeping movements around the pitch, which had the crowd roaring “Ole” each time the ball was passed from one Leeds player to the other and it was rare that anyone had seen the Leeds United playing with such confidence and freedom but thankfully it was preserved for posterity by the BBC TV “Match of the Day” cameras. 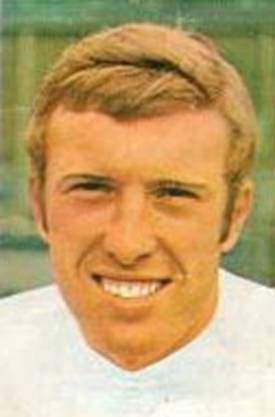 Looking at the quality of the Leeds team that day no one should have been surprised as they fielded a complete team of full internationals and with the exception of Terry Cooper, it was arguably the strongest they could have mustered in their decade of dominance. 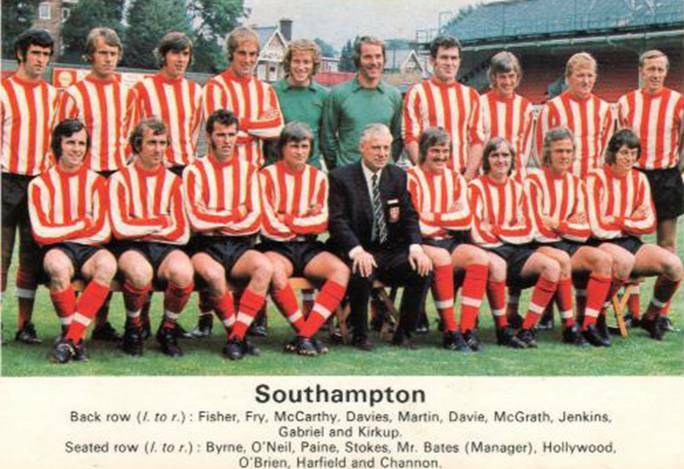 The team that day boasted two hundred and twenty caps between them in their careers. Few other teams of that era would have been able to boast eleven full internationals and certainly not the quality that shone through on the cold March day. 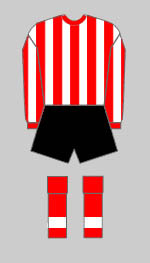 Southampton were not without their own stars and Mick Channon, Terry Paine, Ron Davies and Jimmy Gabriel were all internationals of good standing. 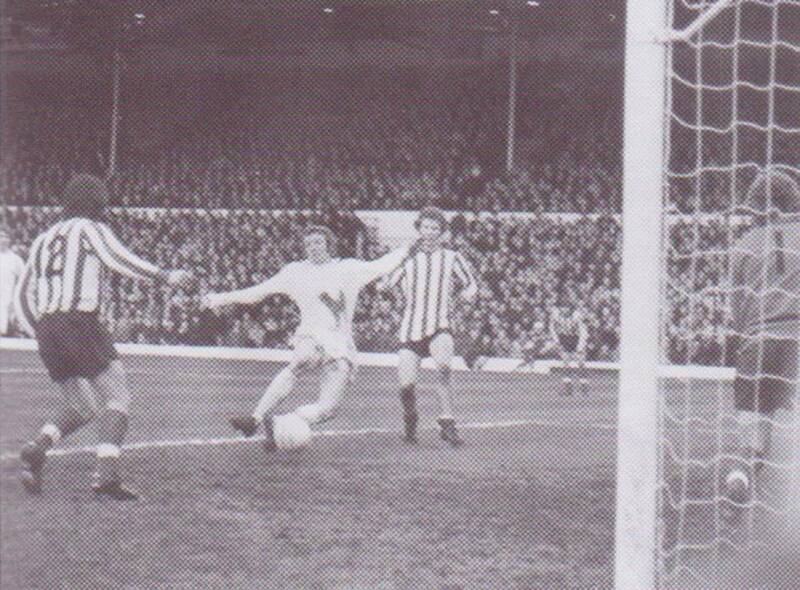 The visitors defended well initially and it was well past the half-hour mark before the home team registered the first goal as Mick Jones and Eddie Gray paved the way for Allan Clarke to get the opener in the thirty-seventh minute. 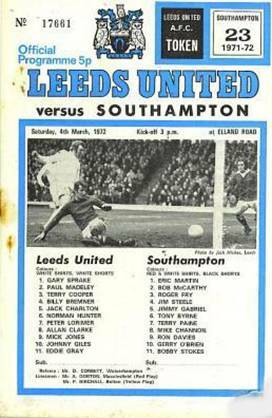 Five minutes later and it was 2-0 as the magnificent Eddie Gray put Peter Lorimer in the clear to score before the teams went off for half-time. In a brilliant eighteen minute spell midway through the second half Leeds rammed home a further five more goals. 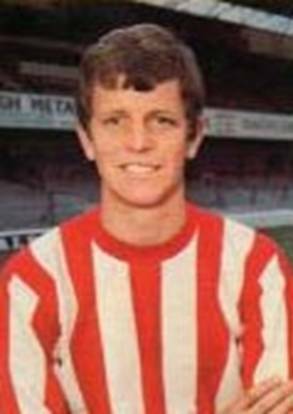 Allan Clarke made it 3-0 on the hour, Peter Lorimer hit a fourth four minutes later and then completed his hat-trick in the sixty-eighth minute. 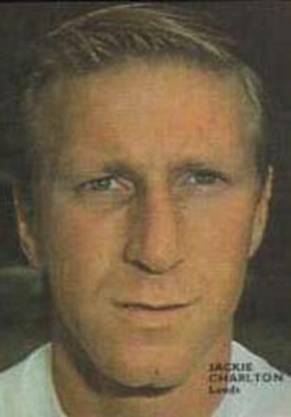 Jack Charlton got in on the act in the seventy-third minute when he got on the end of a Norman Hunter cross to head home the sixty-sixth League goal of his career and Mick Jones , celebrating his three hundredth League game wrapped it up with the seventh with twelve minutes left on the clock. 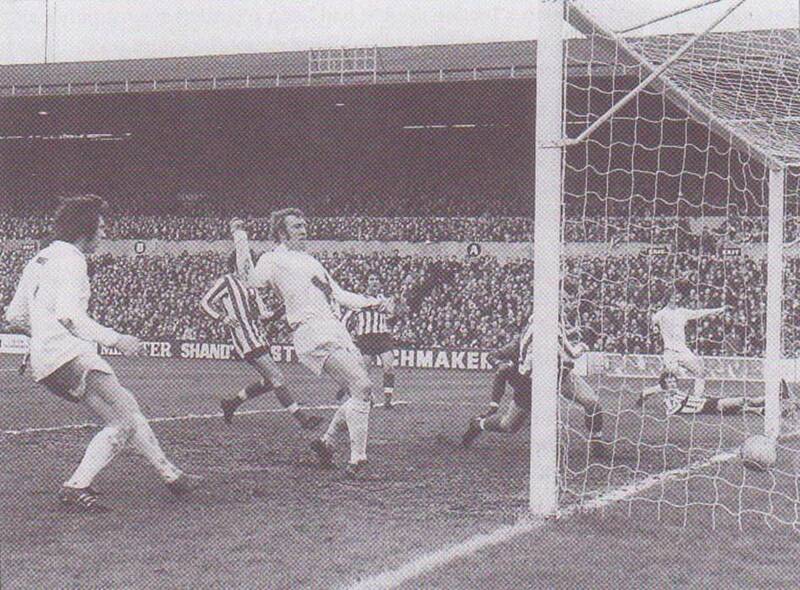 37th minute, brilliant inter-play between Mick Jones and Eddie Gray opened up the defence for Allan Clarke to crack in an angled drive. 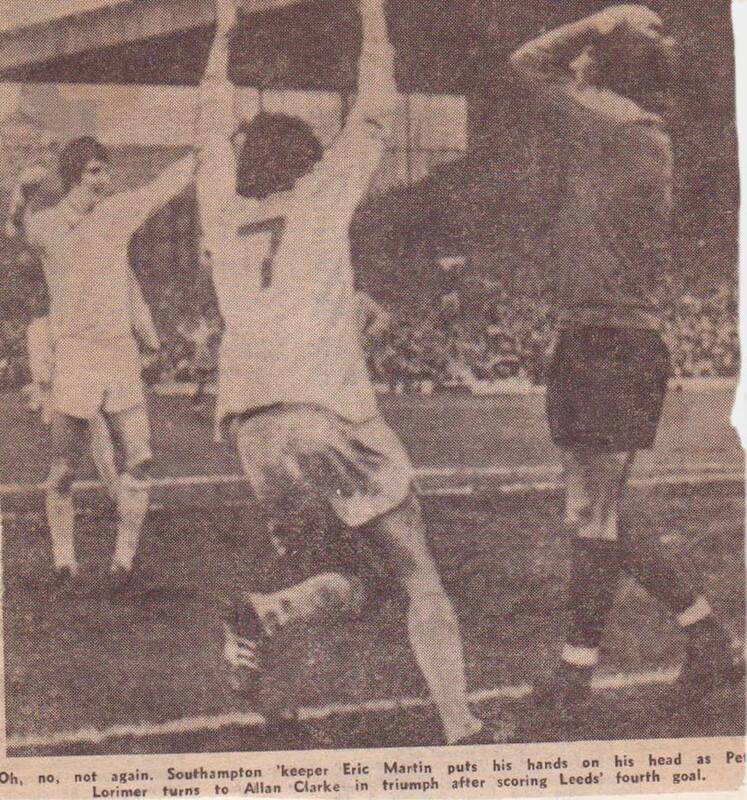 42nd minute, Peter Lorimer drove Eddie Gray’s superb through-pass beyond the luckless Eric Martin. 60th minute, Clarke’s footwork took him round a defender before slotting the third. 64th minute, Lorimer hit the fourth. 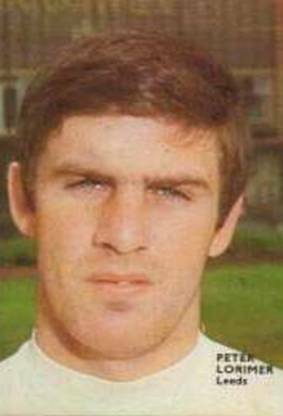 68th minute, Lorimer intercepted an ill-judged Roger Fry back-pass to complete his hat-trick. 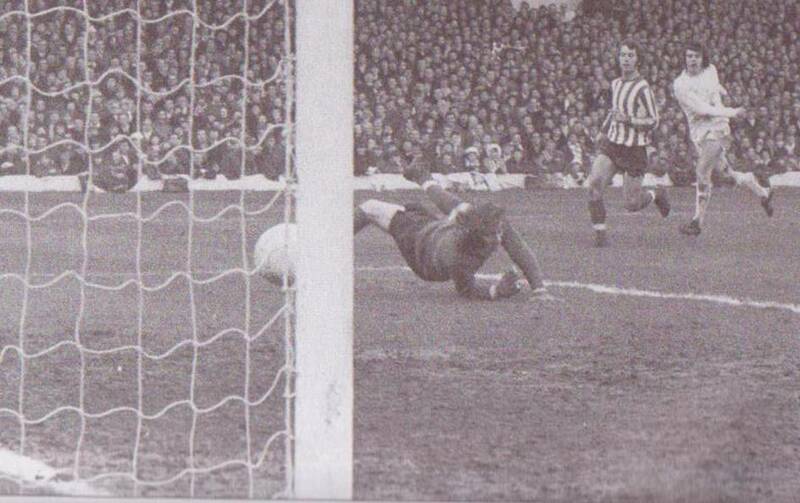 73rd minute, Jack Charlton arrived in the penalty area to head in Norman Hunter’s cross. 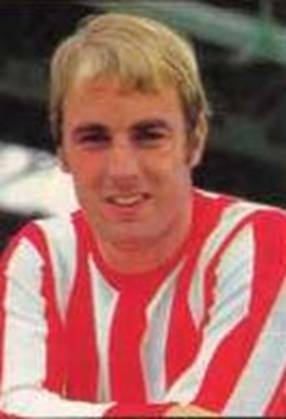 78th minute, Mick Jones celebrated his three hundredth league game by forcing the ball in from close range, after Peter Lorimer headed down a left wing centre from Eddie Gray. 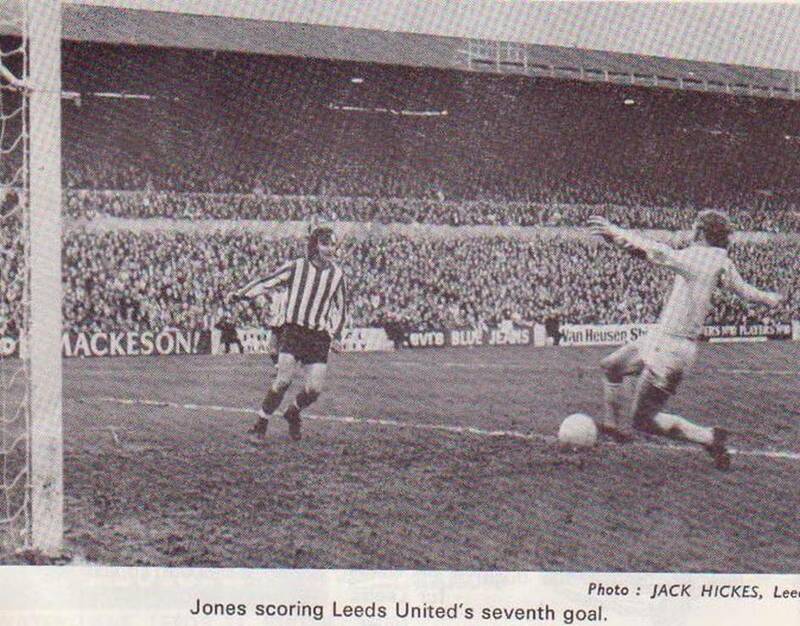 Mick Jones scores the seventh and final goal.